Yet another report has emerged from the Chinese supply chain, suggesting that while the high-end "iPhone 8" will have a curved screen, but it won't be so pronounced as to make it unrecognizable as an iPhone at first glance. 'iPhone 8' concept image by Moe Slah. Samsung continues to be named as the OLED screen supplier for the "iPhone 8," according to the Nikkei Asian Review. Apple has reportedly chosen to not have dramatic curves in the flexible screen as can be found in other products, in order to simplify construction and to cut down on challenges in making curved glass covers to match the angle of the screen bends. As a result of the mild curvature, not much is expected in terms of new features taking advantage of a curved screen. That's in contrast to other manufacturers— namely Samsung and its Galaxy Edge handsets —who have used curved OLED displays for features like notifications that can be viewed when the handset is resting on a table, or new edge gestures that take advantage of a wraparound display. Critics have dismissed those additions as largely gimmicky. The most recent report contradicts ones from February and March suggesting that the "iPhone 8" would have a flat "2.5D" screen, such as that found in the iPhone 7. Suppliers named by the latest report include China's Biel Crystal and Lens Technology for the glass backs, Samsung for the OLED screen itself, and Hon Hai Precision Industry for the front glass covers. Apple is rumored to have signed two deals to buy OLED panels from Samsung. 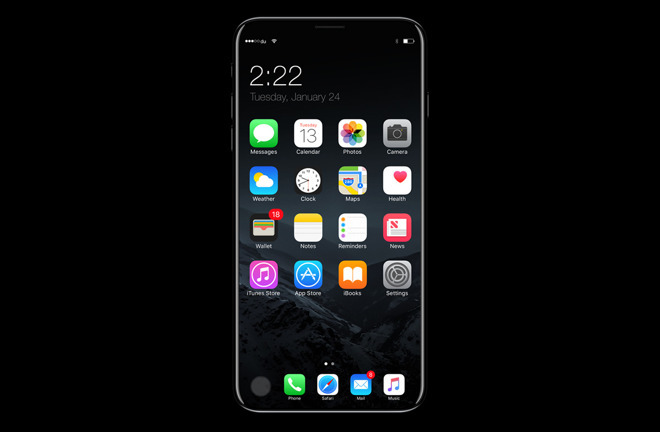 Apple's "iPhone 8" is expected to use a 5.8-inch edge-to-edge OLED panel with a 5.1-inch practical area, the rest being dedicated to virtual buttons. Other features rumored to be included in the device are a 3D facial scanner, and other sensors embedded in the front glass of the device.